Let’s just pretend for a second that Facebook Places aka Facesquare is a charitable attempt on Facebook’s part to quell check-in fatigue by making nice with Foursquare, Gowalla, Booyah and Yelp (and not another attempt by Facebook to turn the world into this). 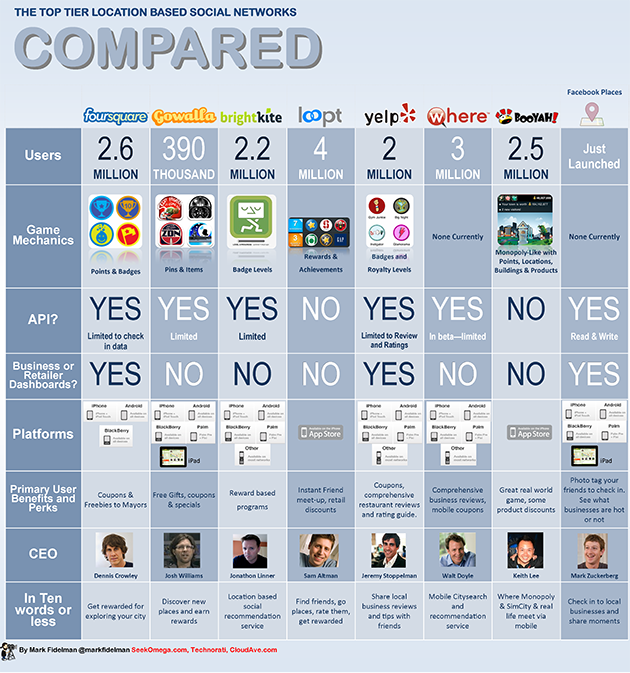 Because Booyah always throws people for a loop (“Who the hell uses MyTown?”) and Loopt’s 4 million users statistic always seems to shock people, we’ve posted this handy LBS comparison below. Water cooler tech forecasters should take note of Facesquare’s current lack of game mechanics. Note: Data for all platforms except Facebook Places was last compiled in July 2010. Booyah has just released figures that sets their user base at 3.1 million. For a hi-res image: Fidelman via Techpp.